Photographers that have pets have something special. In my opinion photographers that have pets have something special. I’m not just writing about the companionship, or the devotion one receives. That relationship is special and important, however, what I am referring to is that pets are perfect models for our portrait photography. Photographers point their cameras at just about everything in their lives. Spouses and children patiently put up with constantly having their picture being taken, but eventually even they need to go on about their lives without being constantly photographed, and when that happens, if you are like me, you go looking for the family pet. Got a new camera or lens? Want to try out that studio lighting technique? Or just bored and want someone ever ready and able to pose for a photograph? Call the dog, or coax the cat. I can’t even begin to count the pictures I have taken of the horses, dogs, cats, parakeets, hamsters, chickens, fish, and frogs I have taken in my life. Those pets never complained when the pictures didn’t work out and even waited for another blast of the flash without blinking. I admit the goldfish aren’t very good posers, and Chuck, the rooster that guards the hens, doesn’t seem too interested in standing still for his portrait, but Peaches, the cat, seems more than ok with posing for long periods of time. Peaches became a resident years ago in the barn, as cats do from time to time. I have no idea her origin, or how old she is, but after a bad run-in with either a wandering coyote or the neighbor’s dog and the follow up convalescence in our home, she somehow moved from the barn to sleeping on my wife’s lap. 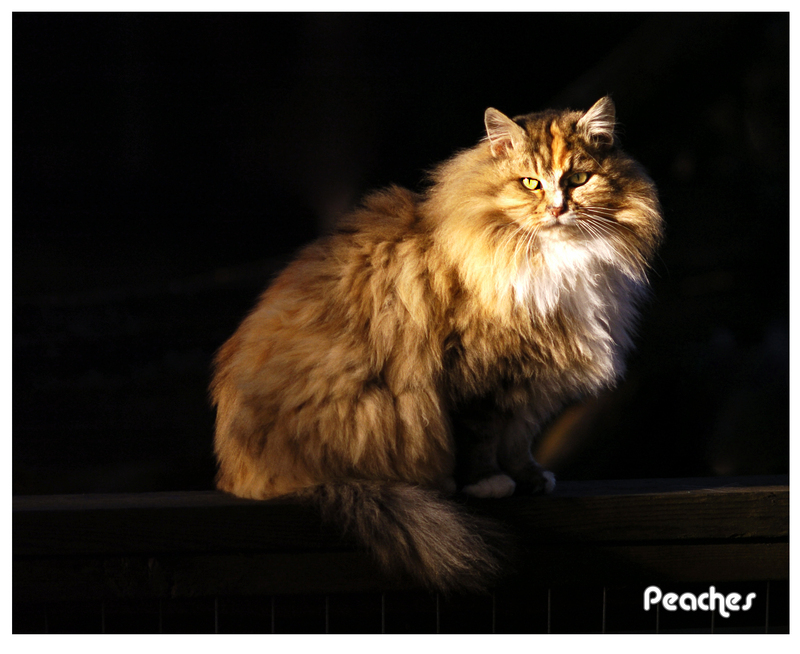 The name Peaches came from when I was feeding three strays one winter. My wife asked me what their names were, but, heck, I just didn’t want them starving in the cold weather and hadn’t bonded enough to exchange names. I explained, “ the black one is named Furry, the spotted one is Furry, and the yellow one is called Furry”. Linda named them Furry, Trixie, and Peaches, respectively. So after Furry got old and died, and Trixie was adopted by a neighbor down the road, Peaches came inside for first aid, a warm place to live, and has become a constant object of my photography. I will admit that cats are great posers. They will sit without moving for long periods of time, giving photographers lots of time to test out lenses, learn flash techniques, and get creative with a camera. Peaches ignores me most of the time, except when she wants food. So I can take all the pictures I want pretty much any time without any interference. She just sits and waits. I have never been one of those picture takers that take cute or silly pictures of the animals with which I share my home. I like portraits, so my pet photographs are usually planned and not much different than a formal portraiture of a person. Actually, that cat is a lot easier than most people because she just sits motionless staring at some spot in space for long periods of time. Other than sleeping and eating, Peaches the cat doesn’t seem to think much else matters, thus she is the perfect poser. “One day Alice came to a fork in the road and saw a Cheshire cat in a tree. Which road do I take? she asked. Where do you want to go? was his response. I don’t know, Alice answered. Then, said the cat, it doesn’t matter.” That quote from “Alice in Wonderland” by Lewis Carroll reminds me of my cat, Peaches. I am not suggesting that photographers should rush out and adopt a cat or any other pet only because they need a model, but if one already inhabits the home then put them to work as an artist’s model. And if any of the pictures are good, then add some words like Merry Christmas or Happy Birthday in PhotoShop and make some cards for your friends and relatives. A photographer asked , “What is a good photograph, and how do I take it?” That was two good questions I received from a young photographer in my shop last week. The “how to” part was the easiest answer and I talked about taking some classes. However, the response to the first question wasn’t as simple an answer. I suggested that a good photograph includes proper composition, exposure, and an interesting perspective, but that was, again all “how to” stuff. That question and the discussion that followed was so very much like what I wrote about in post I made in September of last year, I wrote the following at that time and hope I won’t bore those that already read it. A good photograph is one that makes us have a connection with, or think about, the subject. Or, it could help us understand what the photographer feels about that subject; and can, if successful, evoke some kind of mood, whether good or bad. When I see a photograph that I like, because of my nature and because I have been studying photography and other photographers for years, I begin dissecting it and try to figure out how the photographer made it. When the photograph is good I am aware that the photographer had an understanding of the equipment and the subject he or she used to make the picture. However, I sometimes have to stop myself from doing all of that and just enjoy the photograph. I read the words of these famous photographers and think how each one has inspired me to work harder at making photographs that go beyond just a documentary of a particular subject. I do extend my knowledge with continual viewing of other photographer’s images, and by reading, taking classes and practice. Modifying light and keeping photograph’s exposure believable. A few weeks ago I wrote about modifying light instead of using the direct light from a camera mounted flash. This is a topic I have discussed many times in my years writing for different publications as I strive to persuade photographers to add flash to their portrait photography. Like any photograph, inside or outside, a photographer needs to take into account how all elements in the image are exposed. That’s the reason I prefer using the manual mode on my camera. It makes it easy to set the exposure where I want to make that subject look like it fits into the environment. Here is an example that might help readers. A week ago I photographed a couple in a wide field alongside the South Thompson River. They wanted the white, silt cliffs that jutted up from the grassy flatlands to be visible behind them. The sun (when it poked through the clouds) was bright and cast unflattering shadows on their faces. My goal was to have the correct exposure for the cliffs, the sky, and, of course, my subjects. It was slightly breezy; therefore, my wife held onto a stand with a 33” umbrella and wireless flash I used to provide a fill light that would get rid of unsightly shadows on my subjects. Indoors or out, I always start with the shutter speed. If I need it to be faster I bump up the ISO. Usually I try for 100 ISO, but sometimes I need a higher shutter speed and a wider aperture and that’s when I adjust my ISO. I first decided what exposure would give me a nice sky and scenic white cliffs. In this instance I metered the exposure and then underexposed by two stops to give me a bit of a darker appearing landscape. Then as my subjects were positioning themselves I fired the wireless flash from different positions until I saw that the light on their faces appeared in the way I wanted it. My exposure and flash modes were both set to manual. Using manual exposure gave me consistent control over the ambient light. To find the proper exposure for the flash I just moved it closer till I was satisfied with what I saw in my camera’s LCD. I had balanced the light. There was a nice dark sky, the white cliffs were shining and had defining shadows. My subjects were separated from the slightly darker ambient light without any shadows at all on their faces. The ambient light kept changing quickly as clouds moved in and a storm approached so I switched from manual flash to TTL flash, and because of troubling wind removed the umbrella from the stand, and instead used a small diffuser cup on the flash to modify its light. With the camera in manual mode, the shutter, aperture, ISO, distance of the light to the subject, and power of our light source, all controls flash exposure. Things change with the incorporation of TTL flash. Used together, the TTL camera and flash controls and calculates the flash exposure, and adjusts the power of the flash to deliver and determine the correct flash exposure regardless of the photographer’s choice of shutter, aperture, ISO, and subject distance. How a portrait looks does have a lot to do with how the subject(s) are posed, but I think light and how it is applied is just as important. Using flash, on or off camera, to modify light gives a photographer more control than just using the sun, or relying on a high ISO. In addition photographers must also experiment and learn how to balance the background, or ambient light, with that flash. The location really does not matter, whether inside or out, as long as there is enough ambient light to expose the subject. Pose the subject in front of a window or on the lawn. Then add enough light from another source to achieve the final goal of having the background, the foreground, and the subject exposures all together appear to be balanced and not looking artificial. Every year at this time I attend one of my favorite events, the Vancouver Camera Show and Swap Meet. 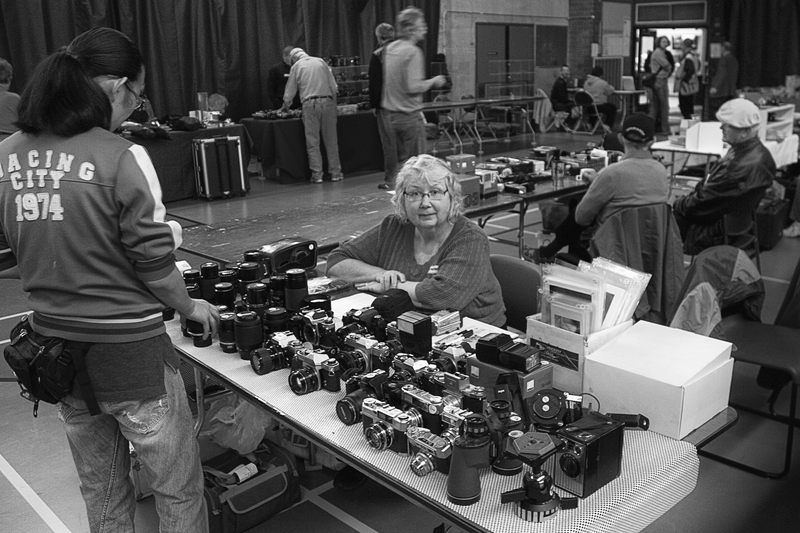 It was held again this past weekend and the Vancouver Camera Swap meet welcomed both vendors and buyers for a very enjoyable day. Put on by the Western Canada Photographic Historic Association, and organized by Siggi and Brigitte Rohde, this long-running show has now reached its 36th year and makes the claim of being the largest (and maybe the best) in Canada with well over 1,000 people walking through the doors of the Cameron Recreation Centre (adjacent to Lougheed mall) where it was held. A large photography and sale like the Vancouver Swap meet brings out an amazing diversity of photographers and what could be better then spending a day surrounded by a vast array of cameras, photography equipment, and talking with other photographers? I’ve been attending over 20 years and for me it’s a great place to sell photography equipment, and it’s a fun day of meeting old friends and making new acquaintances. My wife and I drove from Kamloops the day before and stayed overnight so I would be fresh for an early start the next day. As I entered, there is a buzz from other vendors busy setting up, talking, buying, and selling to each other. I greeted lots of people I have known for years, and then prepared my table to be ready for the swap meets’ early bird shoppers who pay a premium to shop exclusively starting at 9am. By 10am with the regular admission I was busy showing, demonstrating, explaining, and, of course, bargaining with photographers looking for whatever desirous item they had spotted and hoping for a deal that was just as sweet. Every year I go wondering what the latest trends are, or what is popular with photographers I will meet there. This year I noticed a change in those I am accustomed to seeing. Many long time sellers and attendees I have known from previous years were absent and were replaced by a much younger crowd. The easy answer might be, like me, they are growing older. But I think it also might have to do with photography’s changing times, and for those that want to hang on to the “good old days”, so that modern technology and how young photographers are using it might be quite unnerving. In previous years I could expect to be accosted by aging “experts” that shuffled up to my table. They usually weren’t there to buy anything, and mostly were only there to show sellers and buyers how much they know, and how much experience they had. This year most of those I have become familiar with over the years were noticeably absent and, in spite of how exasperating some were, I missed them. Young photographers stopping by my table introduced (for me anyway) a new way of doing photography. I had brought many older, manual-focusing lenses expecting there might be some individuals keen about “retro” equipment and interested in using older cameras from the 1970s and early 1980s, but that didn’t seem to be so this year. This year photographer’s would lay adaptors for different lenses on the table and try different manual lenses with each. They were using modern digital SLR cameras and the adapters allowed them to use the old lenses. And where I would have chosen a focal-length lens like 70mm or longer and stood back to take a portrait, these innovative photographers were selecting 28mm and 50mm lenses, and then moving in very close for portraits of each other when they tested out the lenses. Photography is certainly not a static medium and is constantly changing. 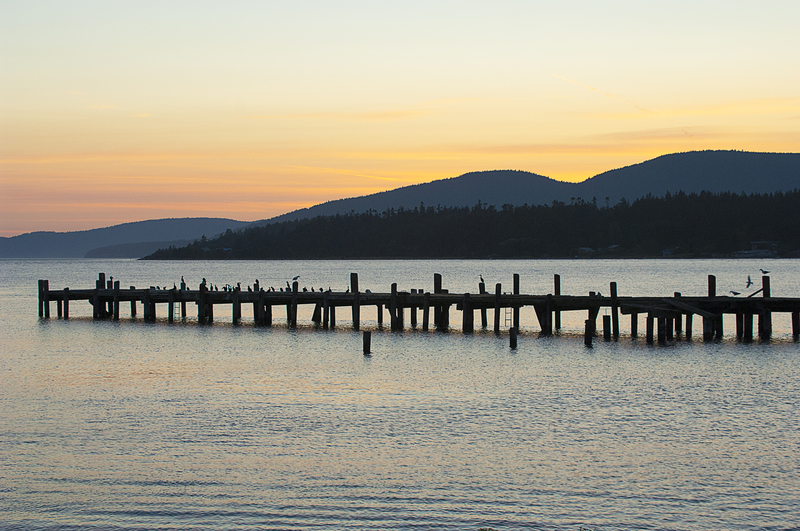 In my opinion, an occasion like the Vancouver Swap is a perfect place to meet other photographers, learn what others are doing, and of course find excellent deals on many kinds of photographic equipment. Whether buying, selling, or just having a good time with other photographers, other than actually taking pictures, I couldn’t recommend a better way to spend one’s time. Follow me by selecting the “follow” button at top left.